I use the art and science of storytelling in my visual and creative communications business, “Picture your ideas”, and as my alter ego Dr Suzie Starfish. WHY? Because art and science are actually more similar than you probably think. Both art and science ask questions to understand and describe our world and although artists and scientists use different methods to do this they both experiment and explore to find their answers and/or express themselves. Thinking like an artist also opens up our minds to seeing and trying new things and thinking outside the box. This creative and critical thinking is becoming increasingly important in our society so to me art is science made clear! I’m very excited about the science and art activities I have coming up this year. 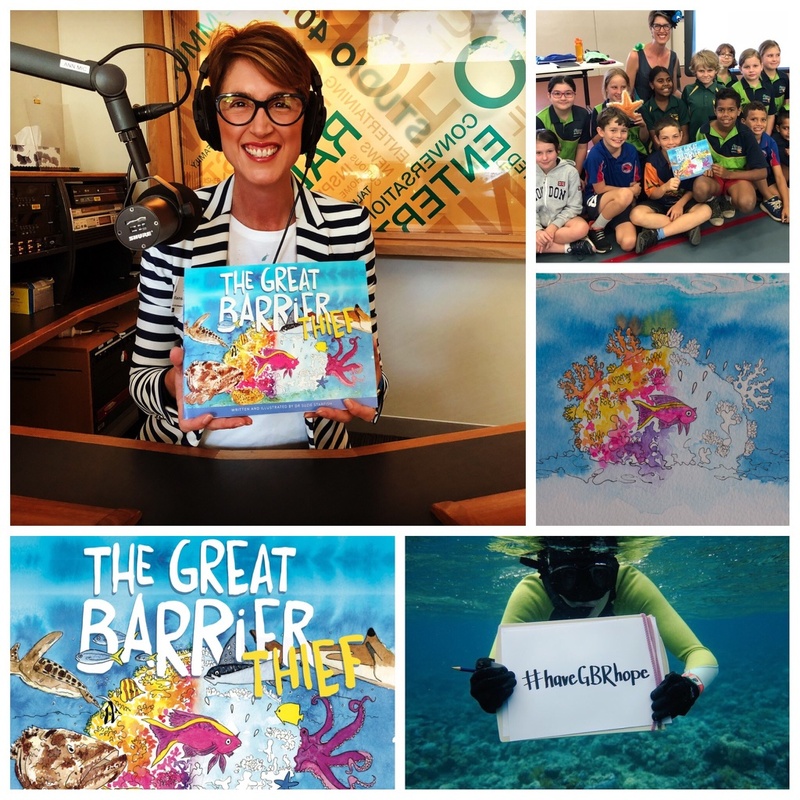 Starting with sharing my children’s picture book The Great Barrier Thief with children of all ages as it combines marine science and art to illustrate the impacts of climate change on our Great Barrier Reef. I would like to thank the fabulously talented Dianne Kelly Artist (photo of me and Di with book) who gave me the ‘illustration inspiration’ to create my picture book. Di has been my watercolour art teacher for 15 years and many many years ago when I was completing my PhD she would listen to all of my stories about my marine research and deep love of the ocean and suggested I put pen and paint to paper and bring those ocean stories to life! So I did, thank you Di! I am also VERY excited to be presenting at the National Education Summit being held in Brisbane this June! I will be drawing out, literally, how I use the art of science in the classroom including how to sketchnote in schools, live sketchnoting on stage and sharing examples of my creative education in classrooms. You can see more about the Summit and the Free Seminar series for educators at https://nationaleducationsummit.com.au/brisbaneabout and how I use sketchnotes in schools at Sketchnote your science. I also use the art and science of storytelling through my graphic recording and creation of infographics and illustrations and this year I will be drawing out a wide range of important and interesting issues including: Positive Behaviour for Learning, Ministerial Student Advisory Council meetings, Human and shark interactions, Closing the Gap, Change management and Creative Education. I use my visual artworks to help share people’s stories and take them on a journey and to help make the complex simple and the simple compelling. You can follow more of my creative journey and dive into my ocean storytelling as Dr Suzie Starfish on Facebook and @suepillans on Twitter and Instagram. I’m SO EXCITED that my first Blog of the year celebrates FOUR years of my creative business “Picture your ideas“!! I can’t believe that its been four years since I took a leap of faith and started my own small business specialising in creative and visual communications. This creative journey has taken me to so many amazing places to draw out many diverse discussions and share people’s important stories. With my pens, paints and paper I’m certainly living my life in colour! Drawing out ideas, information and issues for people is a great job and after four years I never tire of seeing the amazement on people’s faces when they see the visuals I have created of their story. Visual storytelling really is a powerful way of engaging with people to help put people in the picture and help them to see the ‘big picture’. One of my favourite client testimonials sums up my visual storytelling: “Sue makes the complex simple and the simple compelling“. This celebration also means that my alter ego Dr Suzie Starfish also turns four! 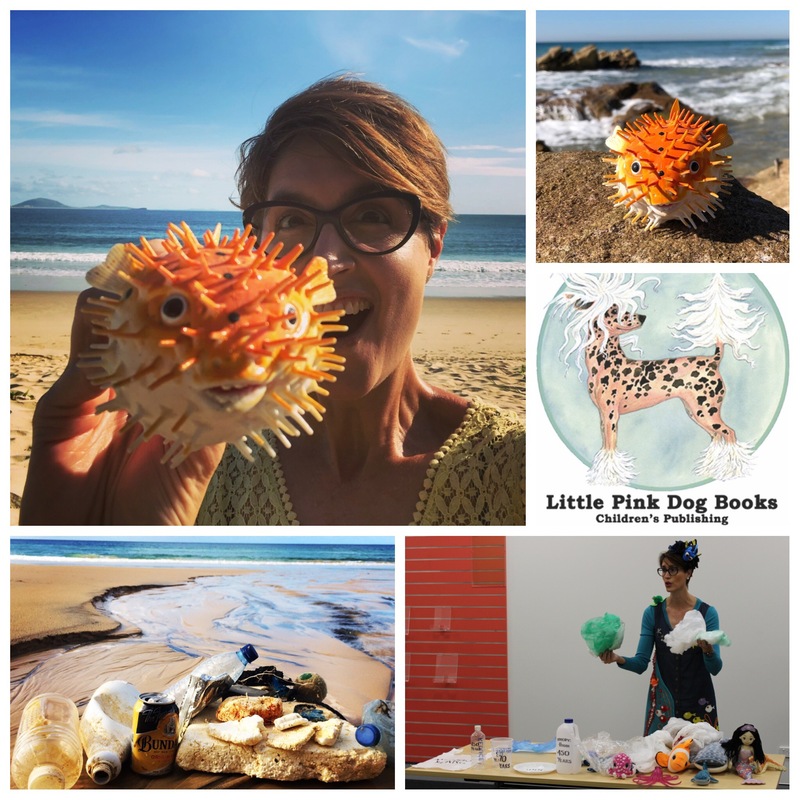 Dr Suzie Starfish started her journey as a Facebook page to help share the wonders of our underwater world through the art and science of ocean storytelling. 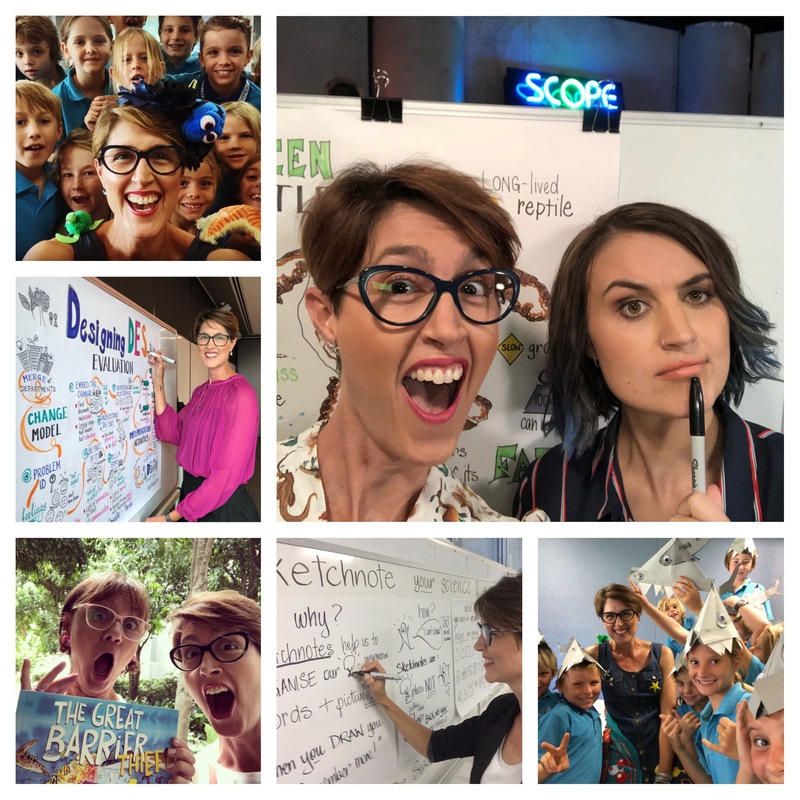 From there Dr Suzie Starfish has been using art and science in schools around Australia (as art is science made clear), is a published children’s author and illustrator (of The Great Barrier Thief) and you will be able to ‘sea’ me as Dr Suzie Starfish on TV soon too! WOW!! Whenever you celebrate a business-birthday it’s a good time to reflect on your journey to ‘sea’ how far you have come and to celebrate those achievements. Four years ago I didn’t even know this “job” existed and over the past four years I have followed my heART to provide a range of creative and visual services I am very proud of. 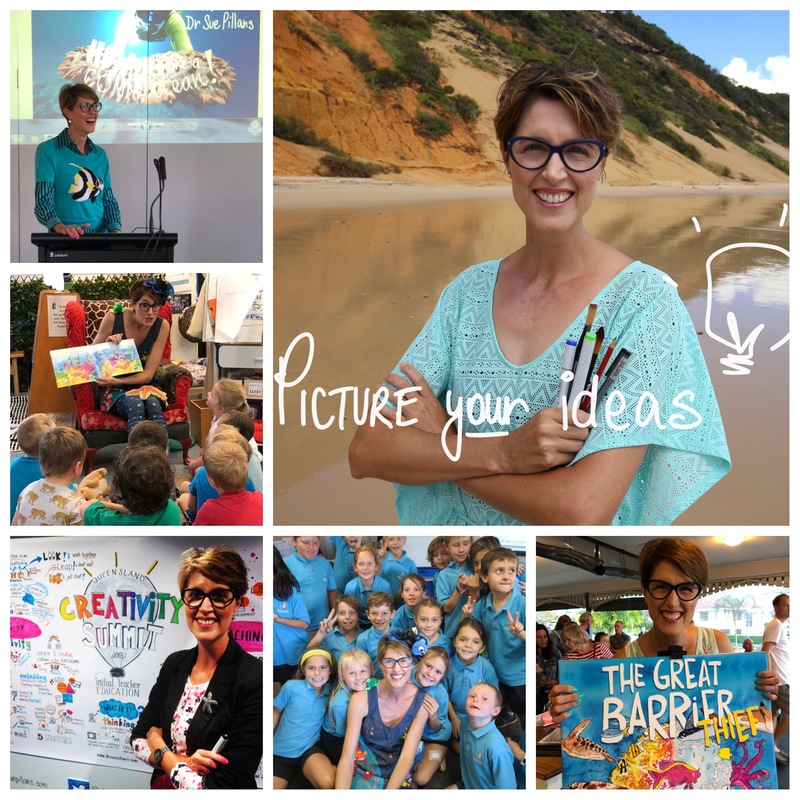 I’m thrilled that I have now worked with over 40 organisations, visited many regional and inner city schools across Australia, started visual and science communication workshops and become a published childrens author and illustrator! Thank you to everyone who has and continues to support my creative journey to “Picture your ideas“. Stay tuned here as I dive into 2019 with my pens and paper and you can also follow my creative journey @suepillans on Twitter and Instagram and @drsuziestarfish on Facebook. What a year 2018 has been for me with so many new creative collaborations, the release of my first children’s picture book, school visits by my alter ego Dr Suzie Starfish and working with amazing people to help “picture your ideas”. I’m always surprised by the amazing reaction I get from people when I draw out their ideas and present it to them as visual artworks. Being able to share my stories and those of others through visual storytelling is the best job ever! Reflecting on my 2018 in pictures has given me lot’s to smile about as I continue to grow my small business by following my heART. It’s a balancing act and a steep learning curve everyday but not everyone can turn something they love into something they live, and I’m so grateful that I have! 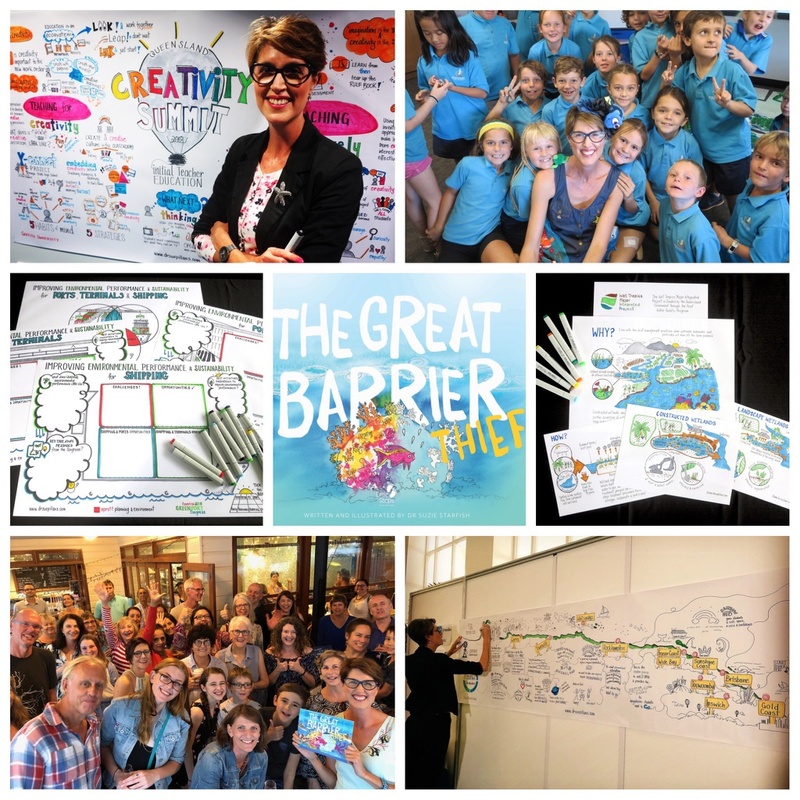 Some of the highlights of picturing 2018 for me have been the release of my first kids picture book The Great Barrier Thief, being part of creative education initiatives, drawing out important local and global sustainability and environmental issues, drawing some of the largest visuals I have ever done, holding science communication and visual workshops, picturing some of the big issues for Queensland school students and my school and kindy visits are always such a joy. And being invited back by some of my wonderful clients for the 2nd and 3rd years of drawing out their ideas is just amazing! A BIG thank you to all of my amazing clients and for the community out there that provides me with such positive feedback and support. Drawing is putting a line around an idea and I love creating visual stories for people to help make the complex simple and the simple compelling. It’s not everyday that you make front page news! So I was VERY excited to ‘sea’ that my new picture book The Great Barrier Thief made its way onto the front page of the local paper this week. Who would have thought a little girl from regional Queensland would grow up to be on the front page of a city paper holding her dreams in her hands! 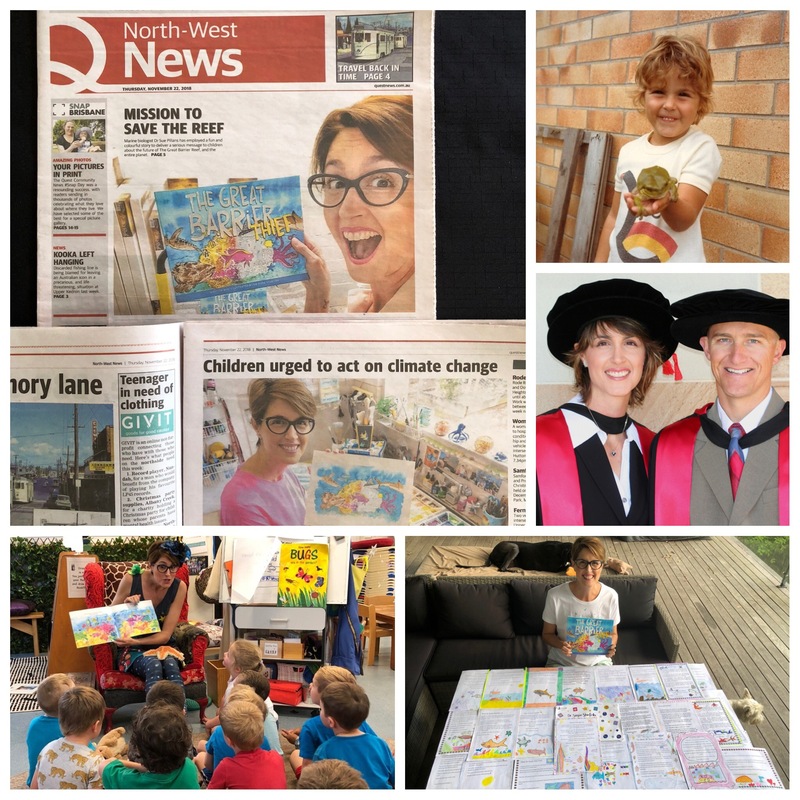 Thank you Quest newspapers for supporting a local author/artist/scientist who is drawing attention to the impacts of climate change on the Great Barrier Reef. It’s times like this that I look back on my journey and I could sum it up by saying it went “From frogs and failures to front page news!“. …My love of nature started from a very early age when I fell in love with frogs (photo of me aged 5 in Bundaberg) and going to the beach. Due to my parents jobs we moved around a lot as kids so I was fortunate to go to many different primary schools in Queensland and ended up in the ‘big city’ of Brisbane so I could one day go to University. High school was difficult for me as I didn’t follow my heART and therefore failed at a number of subjects, and was advised that I should repeat Year 12 if I wanted to get into university (:0). But I did get into university and after many many years of study and research (at Griffith University and The University of Queensland) I received my PhD in marine science (photo of me & hubby graduating together) and ventured into the world of work. And three years ago I started my own creative and visual communications business, “Picture your ideas“. I wouldn’t change my journey as it has led me to where I am today as a marine scientist, artist, children’s author/illustrator and business owner. So, from frogs and failures came my front page news! Apologies for my lack of Blogs over the last few months and the length of this one, but with the recent release of my first children’s picture book I have been a bit busy with my book launch, the marketing and promotion of my book and author visits, all whilst carrying out the other parts of my creative business. I have been overwhelmed by the GREAT response my book has received from children (and adults) in Australia and overseas and I’m proud to say that my book is already found in 6 countries around the world, in schools, kindy’s and libraries throughout Australia and even on the Great Barrier Reef itself (on beautiful Lady Elliot Island)!! SO DREAMS DO COME TRUE! Here is my first children’s picture book, “The Great Barrier Thief“, written and illustrated by my alter ego Dr Suzie Starfish! This book illustrates the impacts of climate change on our Great Barrier Reef. The story is based on marine science and includes solutions and the hope that each one of us can do our part to help protect and save the Reef. You can ‘sea’ more about my Great Barrier Reef story. PRE-SALES of my book are now open in Australia at https://drsuepillans.com/books/the-great-barrier-reef/ with International orders and shipping information available once the books arrive in Australia next month (September 2018). SAVE THE DATE for my book launch in Brisbane which I hope to hold on the afternoon of Sunday 21st October 2018 in Brisbane, details here soon! As a marine scientist, artist and now children’s author/illustrator I also want to carry out a regional book tour, in this the International Year of the Reef , so I can spread the important message about the challenges facing our reef and what we can do to ‘cool things down’ in the face of climate change. As our children are our future Reef stewards I believe every child deserves to ‘sea’ the living colours of the Reef. What a journey it has been to bring this story to life through my words and pictures. It was six years ago that I came up with the idea of the “thief on the Reef” due to the devastating coral bleaching events I was sea-ing in North Queensland. I have worked tirelessly to write, re-write, rhyme, don’t rhyme, draw, paint and think about the solutions to the global issue of climate change suitable for children. I am so very proud of my book and cannot wait for everyone to ‘sea’ it! A BIG thank you to my friend and storytelling mentor Michelle Worthington and Little Steps Publishing who helped to bring this story to life. What a creative time I have been having lately helping people, teams and organisations to communicate their important messages and stories. 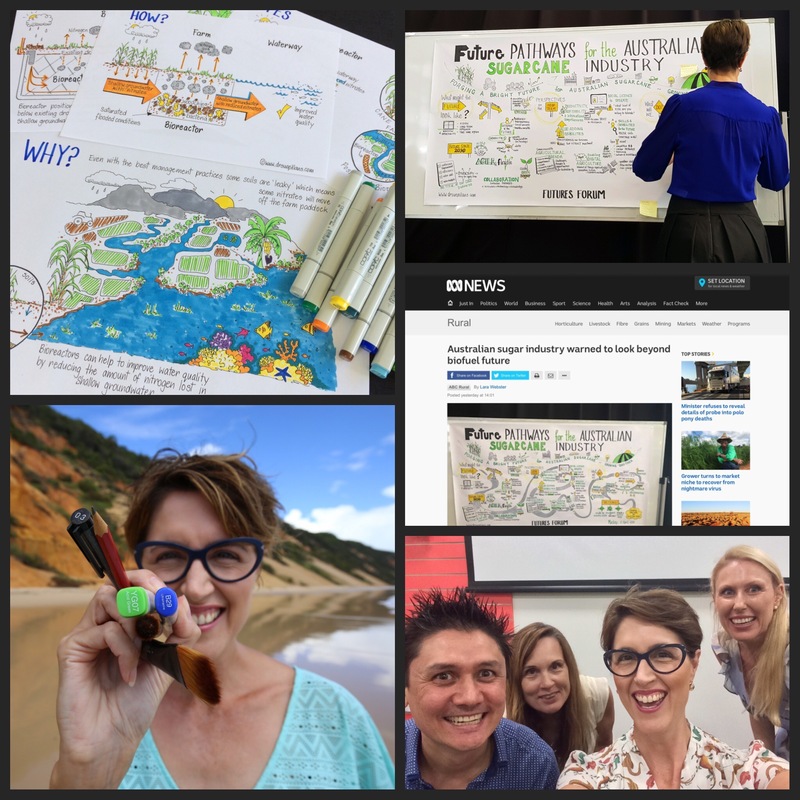 In the past month alone I have been drawing out diverse discussions from creative teaching and learning to bullying and international education from Brisbane to Cairns! The more I see how visuals can engage, educate and excite audiences, the more I see the power of visuals and creative communications for people. It was a privilege and pleasure to visually capture the important discussions of the very first Ministerial Student Advisory Council held by the Queensland Education Minister, Grace Grace MP. It was an honour to hear the students stories and see them have a voice with the Minister. 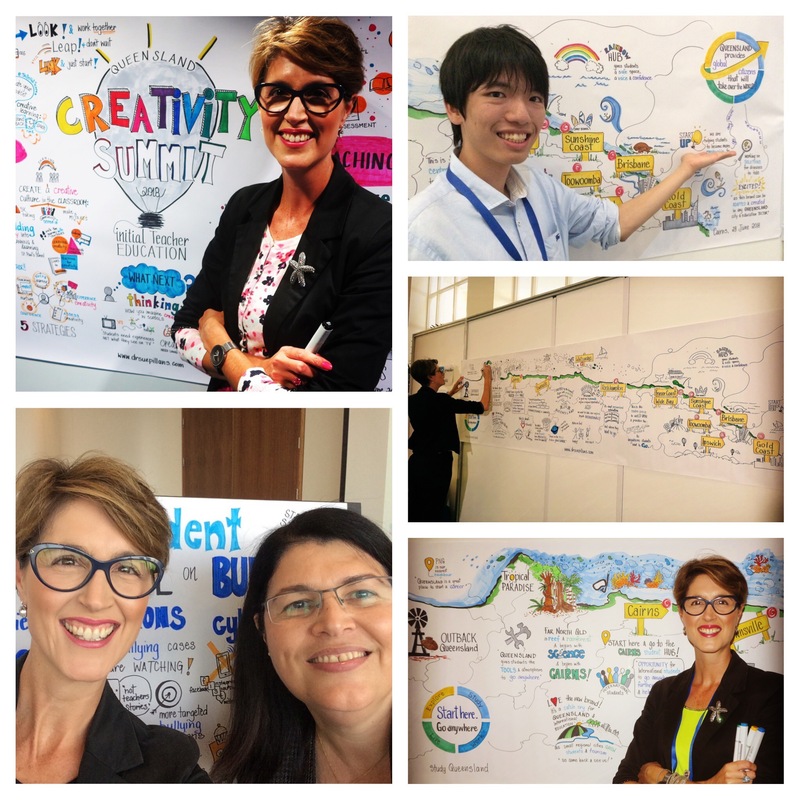 I was excited as an alumni of Griffith University to be invited to visually capture the Queensland Creativity Summit for Initial Teacher Education. Teaching for creativity and teaching creatively were the key themes of the Summit and as someone who runs their own creative business and who is passionate about creative education these discussions and stories were very close to my heART! And I have just returned from Cairns where I was visually capturing the discussions of the Study Queensland Pop-Up at the International Education and Training Summit. I was very busy listening to the excited attendees talk about what the new brand #StartHereGoAnywhere means to them; on the biggest drawing I have done to date!! It’s so great putting people in the picture as I live my life in colour! You can see more of my creative communications via my Graphic Recording, as my alter ego Dr Suzie Starfish and @suepillans on Twitter and Instagram. Making a splash on World Oceans Day! On World Oceans Day I wanted to make a BIG splash about the importance and beauty of our oceans. As a marine scientist and artist I have always been drawn to the ocean and now as a storyteller I love sharing my deep devotion for the ocean with kids of all ages. I do this through the art of marine science and storytelling in the hope that people will ‘sea’ the beauty in nature and fall in love with the wonders of our Blue Planet. 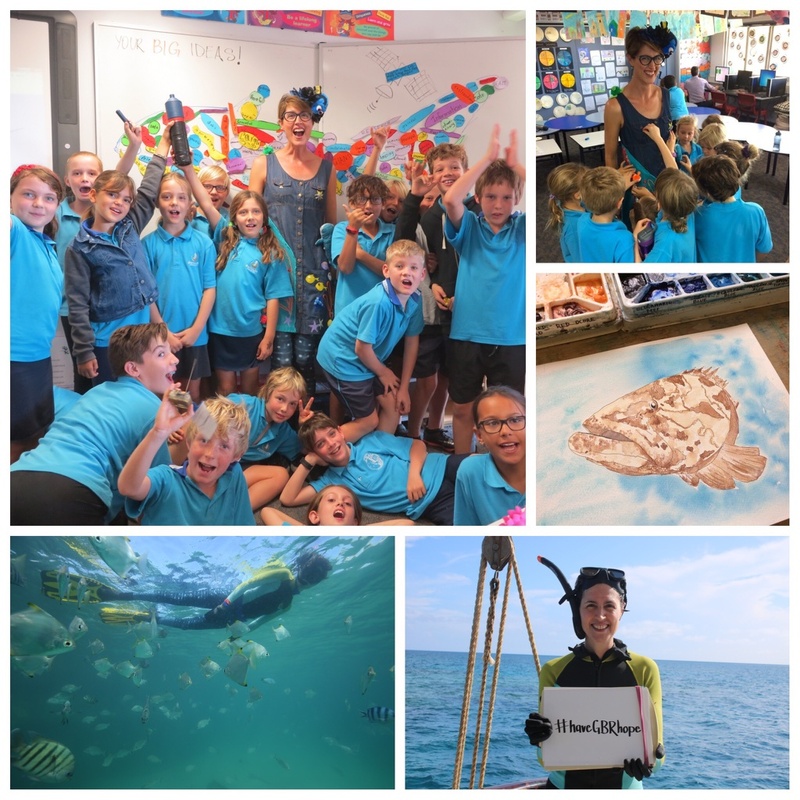 I have been visiting schools as my alter ego Dr Suzie Starfish for the past four years and I get to ‘sea’ first hand how creative education engages, excites and educates kids about our oceans. Our children are our future ocean stewards so it is important for them to learn about, live with and love the oceans, so as they grow up they are moved to protect and save our Blue Planet. And WE can all love and look after our oceans with a BIG splash of #OceanOptimism! For me World Oceans Day is all about celebrating our oceans, the people that study and protect them and the special stories we create from enjoying them. So I’m VERY excited to share that my first kids picture book about the Great Barrier Reef is now at the printers and should be arriving on our shores very soon! In the photos you can ‘sea’ a sneak peak of one of the larger than life characters in my picture book, Stan, the Commander and Chief of the reef. Always #haveGBRhope. The Power of Words & Pictures! What a year it has already been for me as an artist, illustrator and visual storyteller! I started the year locked away in my art studio to finish the illustrations for my first kids picture book, about our Great Barrier Reef. This meant not taking on any paid work, which was a difficult decision to make but one I needed to in order to follow my heART! I’m delighted to say that in making this hard decision I now have my book at the printers and I have been inundated with drawing and graphic recording work since finishing my book illustrations. So sometimes you just have to make the big sacrifices to make your dreams come true! I have also been working on some new and exciting drawing projects this year with people who really value my science-art background and visual creativity. It never ceases to amaze me the power of words and pictures as through my visual storytelling people can engage, empower and educate others and share their stories. My work is never the same and never ever boring, for example I have recently finished drawings about Denitrification Bioreactors for Queensland banana and cane farmers, created unique workshop templates for an International Ports Conference and graphically recorded the Australian Sugar Cane Industry Futures Forum. Highlights for me have been working with passionate people, receiving positive feedback on my visuals AND seeing my graphic recording headlining an article on ABC News! You can see more of the power of words and pictures via https://drsuepillans.com/recording/. During World Creativity and Innovation Week I was also excited and super proud to be part of a panel of Author/Illustrators at the ‘Words and Pictures‘ Workshop for Share your Story. I had such a great time learning about the creative journey of my fellow Author/Illustrators and sharing my journey as a ‘storyboard’ as my alter ego (and pen name) Dr Suzie Starfish. As an Author/Illustrator words and pictures make the story and I love creating them for kids of all ages! My Passion, Purpose & Pictures! I’m VERY excited and VERY proud to share that my creative business “Picture your ideas” turns THREE today! As a “womenentrepreneur” I have grown my small business into a livelihood that helps people to see the big picture through visual storytelling. This year also ‘seas’ my alter ego, Dr Suzie Starfish, celebrating her third birthday of making a comm-ocean in schools by bringing the Living Oceans into classrooms (#bestjobever)! I am thrilled that I now live my life with ESTEAM (Entrepreneurship, Science, Technology, Engineering, Arts & Maths) and help people, schools and organisations to picture their ideas. I was going to list all the amazing projects and pictures I have created with people over the past three years but you can see this from the photos I have posted. Instead, I wanted to take this opportunity to honour and celebrate the person that helped me to follow my heART, my youngest sister Jodie. My sister taught me the true meaning of courage, that you always have to believe in yourself and that life is precious. She is my hero, and a hero to me is someone who gets up when they can’t. Today she would have celebrated her 40th birthday so my gift to her is living my life in colour and taking her memory with me on this creative journey. If you had told me five years ago I would be running my own business I would have laughed and used my hands a lot saying something like, “You’re kidding!”. After reading an article in a magazine about a career that I didn’t even know existed (Graphic Recording) I left my ‘secure’ 9-5 job to start my own creative business. 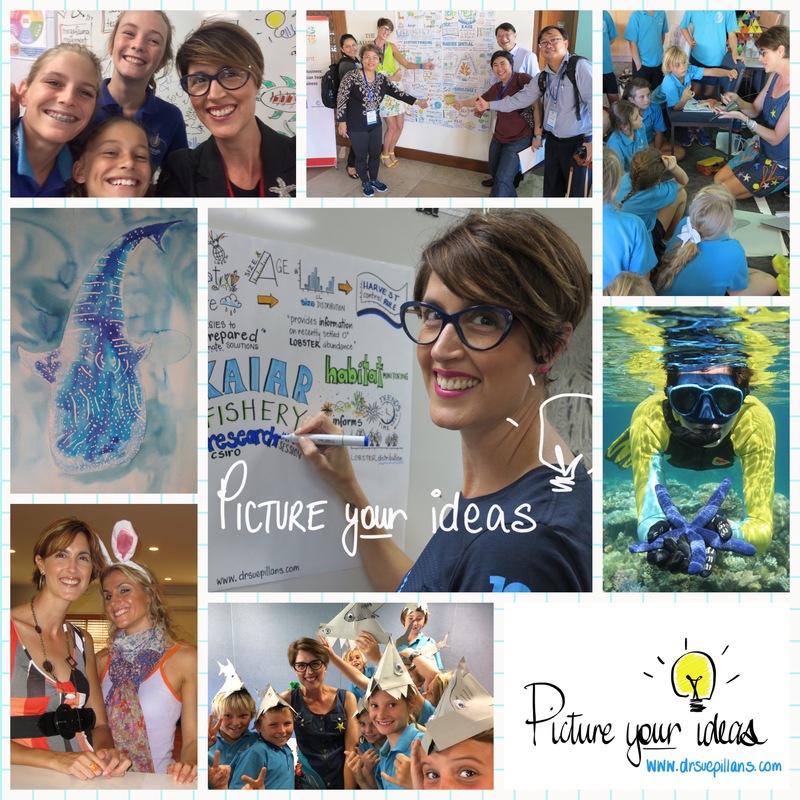 Three years later I have worked consistently and happily drawing out ideas for people, teams and organisations all over the world, visited schools as Dr Suzie Starfish to share my deep love of the ocean and will be releasing my first kids picture book later this year! So I am so forever grateful that I have now turned something I love into something I live. Running your own creative business though can be quite challenging at times and I’m learning every day how to grow as a person and womenentrepreneur. But I couldn’t imagine myself doing anything else now….oh apart from being a guest on the Ellen Show to meet the real-life Dory and live by the beach to get my daily dose of Vitamin Sea! We all have dreams and sometimes they DO come true!! So today I celebrate my passion, purpose and pictures and thank my hubby, fur babies, family, friends and my Tribe for all of their support and the great people I get to picture ideas for! You can also follow my creative journey @suepillans on Twitter and Instagram or contact me via email to see how I can help you to “Picture your ideas” at sue.pillans@internode.on.net.